Leisure Lagoon Hazy Pale Ale will debut at Coronado Brewing’s three locations on Friday, February 15, in 16oz six-pack cans and on draft. The beer will hit broader retail availability later in February and will be available to buy in stores throughout Coronado’s distribution network. The company will also host an outdoor Leisure Lagoon Luau on Saturday, March 2, complete with luau-themed food, live music, and beer specials. For more information about Leisure Lagoon and the Luau, visit www.coronadobrewing.com. Stay Coastal. Cheers. A little bit East Coast, a lotta bit West coast, and 100% juicy! This hoppy pale ale is fermented with London III yeast for a cloudy, hazy finish. So, grab a floaty and join us on the Leisure Lagoon of hoppiness. 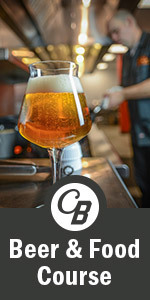 The post Coronado Brewing Debuts Leisure Lagoon Hazy Pale Ale appeared first on CraftBeer.com.